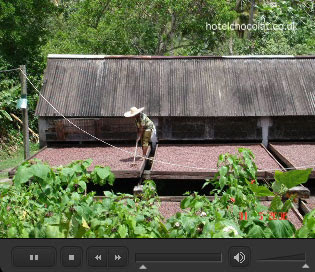 ...watch our recently uploaded video on the Hotel Chocolat website and get a unique insight into cocoa farming from our plantation at the Rabot Estate, St Lucia. Angus introduces the video explaining the story of purchasing the historic Rabot Estate to then detail the cocoa growing, the pods ripening on trees as well as how we harvest, ferment and dry the beans, until they’re ready to make chocolate. This is our first video from the Estate and Phil & Judy are keen to keep us all updated of developments from St Lucia via video/photo format on our website. Feel free to share with your family/friends as the video is also available on our Hotel Chocolat YouTube channel.